Is it possible to constrain the height, volume flow, or distance of a waterfall from the quantitative analysis of a high-quality recording of its sound? As an aside, the simulated sounds of fluid splashing or pouring water have been synthesized by computer. The group that did this research was at Cornell University. This seems like an example of a solution to the forward problem. If you listen to the simulation with closed eyes, can you distinguish the waterfall from the running faucet? Raindrop sizes have been identified by different physical mechanisms associated with the drop splashes and used as a basis for acoustic rain-gauges. The spectrum of waterfall sound is qualitatively described as ‘broadband’ or ‘brown noise’ and I have not yet found a good example of an actual acoustic spectrum for a waterfall. I think that the total sound energy radiated into the air (and into the ground) would equal the gravitational energy released by the falling water – less a small amount of energy that is turned into heat and warms the water. It seems to me that the spectra of a 100m versus a 1000m waterfall might have predictable different ratios of low-frequency and high-frequency power. Are there fluid mechanical or acoustic mechanisms that come into play for the higher falls which do not operate at lower heights? Could there be diagnostic sounds related to cavitation? Would there be too much sound reflection and scattering in a real waterfall basin to make measurements? OK, I think I have a satisfactory answer to my question now and I have awarded the bounty to zhermes. I believe his response correctly describes the underlying physics of the problem, and once I got that I was able to find a lot more relevant information and perform some pretty approximate preliminary calculations. In a nutshell, the important physical process may be the resonant scattering of ambient sound inside the turbulent waterfall by ‘bubble clouds.’ This is referred to as Minnaert resonance and has been extended to describe ‘bubble clouds’ as well as individual air-bubbles. The approach has been used productively to analyze the noise of propeller blades and the sound of ocean waves. I found it a useful way to begin thinking about how the sound of a waterfall may be affected by the height of the falls. One (obvious) insight is that it seems that it has to be sound being generated in the plunge-pool at the base of the waterfall that contains information about the full height. Sounds originating in the flow 10 meters from the top of a 1000m falls should be no different than for a 10 meter falls. Once the water falls the additional 990m, it has also gained more kinetic energy which would be available to generate a ‘bubble cloud’ having a size dependent upon the waterfall height. Equating the gravitational energy of water at the top of the falls, the kinetic energy of water when it hits the plunge-pool, and the work to push a jet into the pool, I calculated the maximum depth the jet could penetrate into the pool and took that as the maximum size of the ‘bubble cloud.’ This estimate for the ‘bubble cloud’ size is proportional to the inverse square-root of the waterfall height. Substituting in standard conditions for water and pressure, this analysis yielded a low-frequency cut-off frequency (which was also the frequency of maximum power) that was far into the infrasound range (<20 Hz) and below the frequency range of human hearing. The conclusion to draw from these calculations may be that the pitch of high and low waterfalls is not very different in the range of human hearing. Differences might be perceptible for falls having large volumetric flows that are capable of generating lots of power at the limits of hearing. Differences might also be perceived (felt rather than heard) as infrasound. Perhaps this explains why MP3 recordings of waterfalls, cascades, and streams sound so similar? We may be missing the information coming to us as infrasound. Please note that the following is all conjectural. I only volunteer it due to the lack of other responses after numerous days, the coolness of the question, and the probably lack of people/references who are explicitly experienced with this specific topic. As a general relation, I'm sure one can correlate the sound-volume with the total energy being dissipated --- but the noise produced is going to be a (virtually) negligible fraction of that total energy (in general, sound caries very little energy1). To zeroth order, I think it's safe to assume the waterfall produces white-noise, but obviously that needs to be modified to be more accurate (i.e. probably pink/brown to first order). Also, by considering the transition from a small/gradual slope, to an actual waterfall, I can convince myself that there is definitely dependence on the height of the fall in addition to the water-volume2. How would height effect the spectrum? Generally power-spectra exhibit high and low energy power-law (like) cutoffs, and I would expect the same thing in this case. In the low-frequency regime, if you start with a smooth flow before the waterfall, there isn't anything to source perturbations larger than the physical-size scale of the waterfall itself. So, I'd expect a low-energy cutoff at a wavelength comparable to the waterfall height. In other words, the taller the waterfall, the lower the rumble. There also has to be a high energy cutoff, if for no other reason, to avoid an ultraviolet catastrophe/divergence. But physically, what would cause it? Presumably the smallest scale (highest frequency) perturbations come from flow turbulence3, and thus would be determined primarily by the viscosity and dissipation of the fluid4. Generally such a spectrum falls off like the wavenumber (frequency) to the -5/3 power. But note that this high-frequency cutoff wouldn't seem to change from waterfall to waterfall. Low-frequency exponential or power-law cutoff at wavelengths comparable to the height of the waterfall. High-frequency power-law cutoff from a kolmogorov turbulence spectrum, at a wavelength comparable to the viscous length-scale. These regimes would be connected by a pink/brown-noise power-law. The amplitude of the sound is directly proportional to some product of the flow-rate and waterfall height (I'd guess the former-term would dominate). E.g. 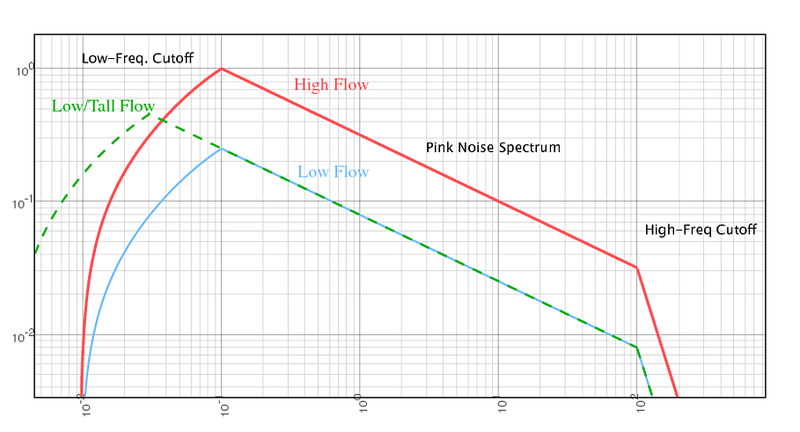 : The following power spectrum (power vs. frequency - both in arbitrary units). I suppose its possible waterdrop(let)s could source additional sound at scales comparable to their own size. That would be pretty cool, but I have no idea how to estimate/guess if that's important or not. Probably they would only contribute to sound at wavelengths comparable to their size (and thus constrained by the max/min water-drop sizes6...). Water, especially in a mist/spray, can be very effective at damping sound (which they used to use for the space-shuttle). I'd assume that this would have a significant effect on the resulting sound for heights/flow-volumes at which a mist/spray is produced. The acoustic properties of the landscape might also be important, i.e. whether the landscape is open (with the waterfall drop-off being like a step-function) or closed (like the drop-off being at the end of a u-shaped valley, etc). Finally, the additoinally surfaces involved might be important to consider: e.g. rocks, the surface of the waterfall drop-off, sand near the waterfall base, etc etc. 1: Consider how much sound a 60 Watt amp produces, and assume maybe a 10% efficiency (probably optimistic). That's loud, and carrying a small amount of power compared to what a comparable-loudness waterfall is carrying. The vast-majority of waterfall energy will end up as heat, turbulence, and bulk-motion. 2: I'd also guess that height/volume blend after some saturation point (i.e. 1000 m3/min at 20m height is about the same as 500 m3/min at 40m height)... but lets ignore that for now. 3: Turbulence tends to transfer energy from large-scales to small-scales. 4: Figuring out the actual relation for the smallest size-scale of turbulence is both over my head and, I think, outside the scale of this 'answer'. But it involves things like the Kolmogorov spectrum, and associated length scale. 5: Distance could be estimates based on a combination of the spectrum and volume level - to disentangle the degeneracy between sound-volume and distance. 6: Perhaps the minimum droplet size is determined by it behaving ballistically (instead of forming a mist)? excellent discussion, Im currently researching small scale water falls in the UK. In my research so far using 1/3 octaves I have found the spectra of various shaped waterfalls to be similar (and a combination of Pink and White). Special features, rocks, curvature, head height seem to have a considerable effect as does width and angle of inclination with which the water impacts the downstream surface/plunge pool (as not all have large plunge pools) I have the signal recordings and could in effect post process into much smaller frequency bands. In addition to this, size effect results show that various parameters measured at the field sites contribute varying large size effects to different frequencies in a non linear fassion and stochastically in some instances. There is a book called the Acoustic bubble by T Leighton which may add some crazy maths for those who care; it is my belief that bubbles will have a significant impact on the spectra recorded from bubble burst to sound absorption in certain frequencies. 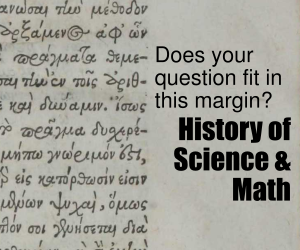 Although I don't have the ambition to fully answer the question (I'm not an expert in either acoustics or fluid mechanics), I'll try and share my point of view of things with everyone. Hopefully, someone will catch on and be able to get somewhere from there. You suggest determining three main parameters – height, volume flow and distance – by analysing the recording of the sound. First of all, you will have some serious difficulty finding the distance. Although, in a perfect scenario, the sound intensity should follow the inverse-square law with the distance, it will be largely affected by the terrain in practice. Consider standing hidden behind a large rock or in a direct line of sight of the waterfall, with both distances being equal. In the first case the sound will definitely be noticeably weaker. The sound will also probably differ when you stand in a marrow valley or on an open plane. So let's skip the distance. Suppose we have a fine spot close to several waterfalls, each similar and in similar conditions. Now, we are just interested in the height and flow of the waterfall. I agree with you that the sound energy will be given by the gravitational energy of the falling water – but for some friction, possible change in kinetic energy of the water and loss due to turbulence of the flow. Now, the first thing I am not sure about is, how are these losses affected by the height or the flow of the waterfall? Will the losses change linearly with these parameters or is the relation more complex? And are there other factors that can play role? Second important question is, how is the sound of the waterfall affected by its height and flow? Does one of them have a stronger impact on the spectrum than the other one? Or does a waterfall with a height $h$ and flow $Q$ have the same sound as a waterfall with height $2h$ and flow $Q/2$? In my ignorance, it is as well possible that the spectrum will not be affected at all and they will sound the same, just with different intensity. To my (lack of) knowledge, these questions cannot answered by some simple theoretical predictions and the only possible way to find a solution might be to directly measure the sound of several waterfalls and compare it. But as I said, I'm not skilled in this field and might as well be completely wrong. Finally, as far as practical realization is concerned, it will be very difficult to measure sound of different waterfalls in the same conditions. The sound will be strongly affected by reflection (if you have rocks all around, the reflection will be stronger than in the middle of a forrest), or other noise sources (such as the water flow below or above the waterfall). But one moght be able to eliminate these in post-processing if one knows the conditions in which the recording was taken. Before I finish, I remind once again that I am not an expert in the fields of acoustics or field dynamics and it is possible that my argumentation is wrong. But I believe that this post can start a discussion that will lead to a conclusive result. Edit: As was pointed out to me by BrianWa in the comments, the height of the waterfall will affect the speed of the droplets that fall down and this will certainly affect the spectrum of the sound. However, I believe that this change will be observable only until such a height that the air resistance during the fall compensates the gravity and the droplet does not increase the speed anymore. All waterfalls higher than this threshold will thus probably have the same (or very similar) sound spectrum. I would speculate that the higher the fall, to some point, the faster the water at the surface is pushed down as a result of the waterfall hitting the surface. So there may be a Doppler effect within the bubble that compresses the underwater sound more for higher falls. Whether or not this affects enough of the sound during the bursting time is questionable. I would guess a faster advancing wall of the top of the bubble creates some higher frequency sounds. But the human ear cannot discriminate different frequencies that are too close to each other (masking in psychoacoustics). Thus spectral analysis would have to be done. Analytically, I would speculate mass is shifted from lower to higher frequencies, across the spectrum, for higher waterfalls (up to some cutoff due to terminal velocity). Not the answer you're looking for? Browse other questions tagged fluid-dynamics everyday-life acoustics or ask your own question. Why do power lines buzz? Why is it so easy to create audible sound? Is there any noise in or around cumulus / cumulonimbus clouds?